The following document is the minutes of the Ordinary Council meeting held 28 July 2016. These minutes are subject to confirmation as to their accuracy at the next meeting to be held on Thursday 11 August 2016 and therefore subject to change. Please refer to the minutes of 11 August 2016 for confirmation. Pastor Ross Duncan, Anglican Church Nambucca Heads, offered a prayer on behalf of the Nambucca Minister's Association. 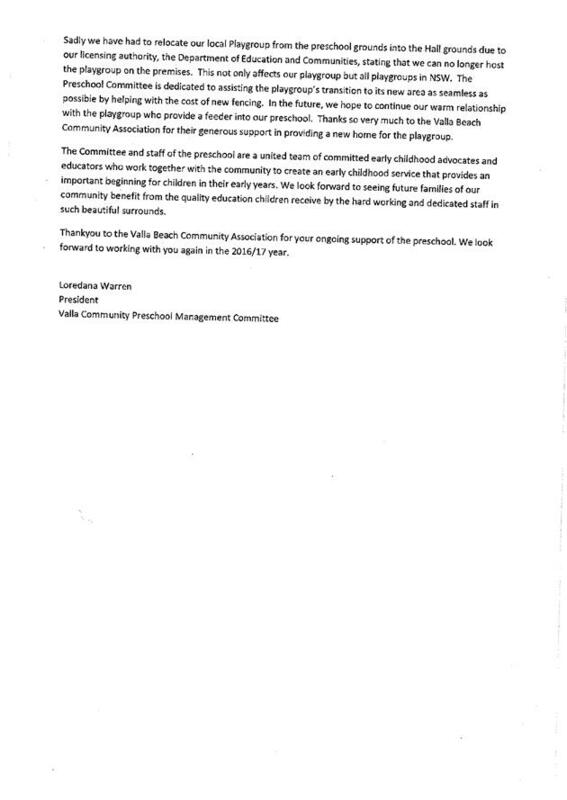 Councillor B Morrison declared a non-pecuniary less significant conflict of interest in Item 5.3 Notice of Motion - Outstanding Water Rates - Not for Profit Organisations under the Local Government Act as Cr Morrison is a social member of the Nambucca Heads Island Golf Club. He holds no executive position in the Club and is not involved in any decision making committees. 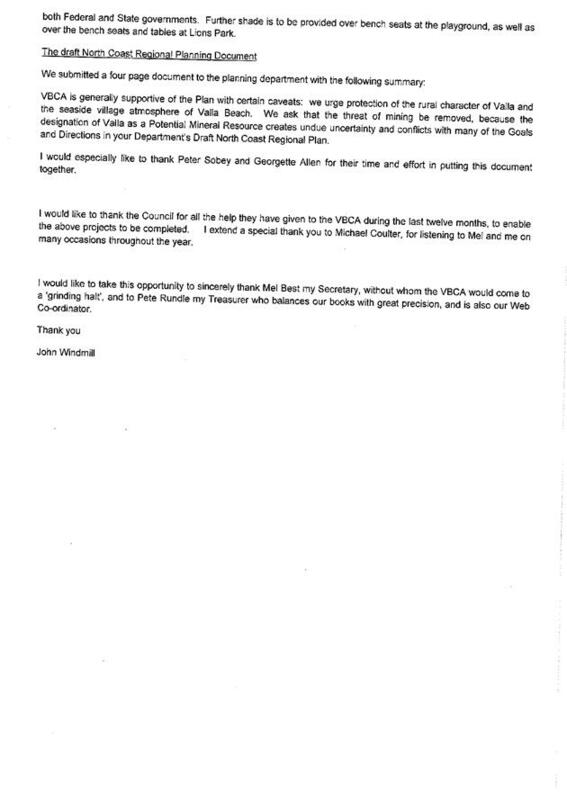 Councillor K MacDonald declared a pecuniary significant conflict of interest in Item 11.1 T006/2016 Tender for the Design and Construction of a Pressure Sewerage System at South Nambucca Heads under the Local Government Act as Cr MacDonald's sister will receive an invoice regarding sewerage connection as a result of this tender. Cr MacDonald left the meeting for this item. Page 14 Motion: Item 12.2 –Cr Morrison believes that the motion was Withdrawn (not Lost). 2 That all Committees be advised of the requirement that an Acknowledgement of Country be included in the agenda and performed at the commencement of each meeting. That this item be deferred to first meeting of the new Council. That Cr Bob Morrison be granted leave of absence in accordance with Section 234(d) of the Local Government Act for Thursday 11 August 2016. Item 5.3 was dealt with under Delegations. 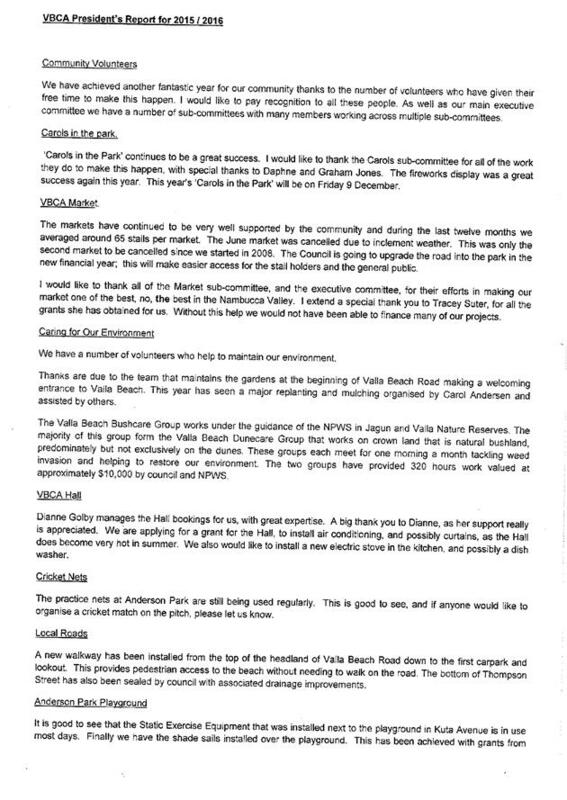 That Council apply the "vulnerable customer" concept to the Nambucca Heads Island Golf Club from the beginning of last financial year (1 July 2015) at the applicable water, sewerage and trade waste charges for the golf club at the normal rate for the first 10,000kl usage per year (833kl per month) and thereafter 50% of the applicable rates. 1 That Council write to Nambucca Heads Island Golf Club and ask them to advise on action they have taken and intend to take to ensure their financial sustainability and reduce their water consumption into the future. 2 That Council receive a report on alternate methods to assist the Nambucca Heads Island Golf Club without altering Council’s adopted fees and charges to be considered by the new Council. 3 That Council request a definition of the term “vulnerable customer” from the Office of Water. Note: Cr Morrison requested his vote be recorded against the motion as he believes there is no equity in the decision. The Aquatic Centre receives $450,000 in assistance but the Golf Club receives no assistance but instead pays $100,000 in fees, charges etc. That item 10.1 be brought forward as there were interested parties in the gallery. 1 The information on proposed administrative arrangements for an interest free loan to the Committee of Management, Gordon Park Tennis Centre be received. 2 That the information on opportunities for securing financial interests in the Gordon Park Tennis Courts and associated buildings be received. That Council note the response provided by the Manager Water and Sewerage. 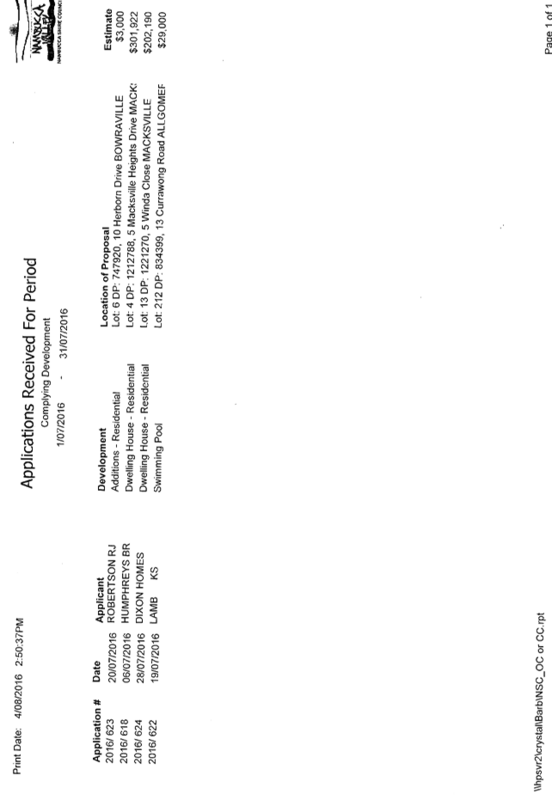 That the information concerning Office of Local Government Circular No. 16-22 concerning changes to the Local Government Act 1993, the Election Funding, Expenditure and Disclosures Act 1981 and the Local Government General Regulation 2005 be received. That Council write to the Office of Local Government requesting a definition of the term "property developer" and "associate of a property developer" for the purposes of Circular No 16-22. That Council provide the 2016 Macksville Gift with sponsorship of $1,000. 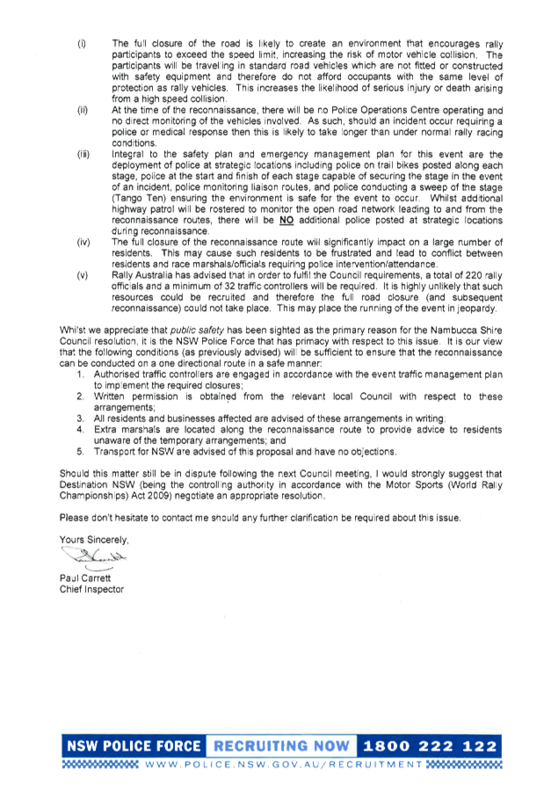 That Council forward a submission on the Discussion Paper, Economic Development in Aboriginal Communities, noting the concerns raised in this report and any other matters which Councillors may wish to include being the concern about the limitations placed on economic development caused by restrictive titles. 2 Following consideration of the report by Council’s Estuary Committee, there be a further report to Council concerning a possible maintenance dredging strategy. 3 That Council undertake consultation as per its native title obligations. 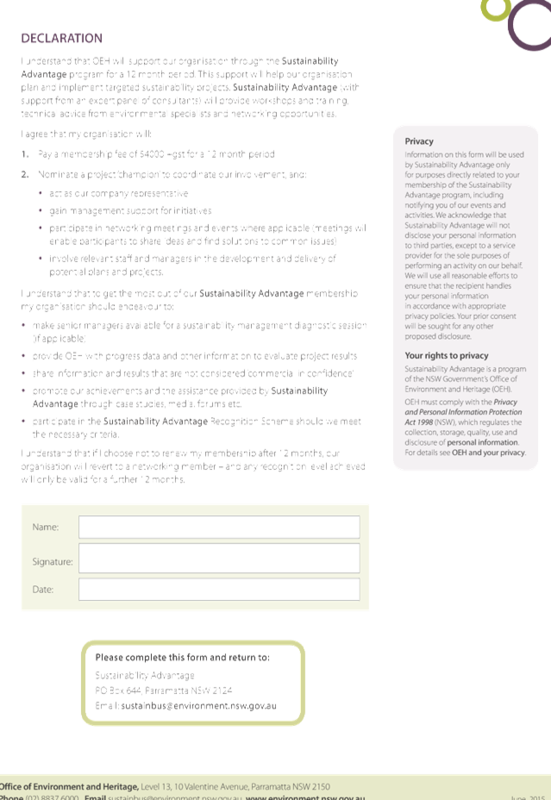 4 That the native title claimants be provided with a copy of the report. That Council note the proposed meeting with Coffs Harbour and Bellingen Shire Councils to discuss the implications of the fire at the Englands Road waste processing facility. Item 10.1 was dealt with above. Cr MacDonald left the meeting for Item 11.1 at 7.21pm and returned after the conclusion of the item at 7.25 pm. 1 That Council accept the tender submitted by Pressure Sewer Services Australia Pty Ltd subject to an acceptable financial assessment in accordance with the recommendations of the Tender Recommendation Report prepared by NSW Public Works. 2 That Council accept the fee proposal from NSW Public Works for the project management of the construction phase of the project. 3 That Council write to affected landowners and advise them that a contract for the pressure sewerage system has been awarded to Pressure Sewer Services Australia and that the contract includes an electrical audit prior to installation of the pump station units. Property owners will be responsible for costs associated with upgrading electrical works to meet current supply standards. 1 That the Capital Works Report for the fourth quarter of the 2015/16 financial ending 30 June 2016 be received and noted. 3 That Council note the over expenditure of $85,000 on Lovedays Bridge on Upper Warrell Creek Road emanating with the change from a timber structure bridge to a prefabricated concrete bridge structure and that the over expenditure has been contained within the Bridge Capital Works Program and offset with savings within the construction of other bridges. 4 That Council allocate an amount of $154,000 within the 2016/17 financial year as a “betterment component” from Working Funds to complement the $250,000 Natural Disaster Recovery Funding (NDRF) received for Bradleys Bridge to construct a prefabricated concrete bridge structure. 5 That Council allocate an amount of $175,000 within the 2016/17 financial year from the Plant Reserve and $25,000 from Working Funds to complement the purchase price to replace plant No.5138 Isuzu tipping truck and retain the old truck to convert it into a permanent water cart as resolved by Council at the meeting held 28 April 2016. 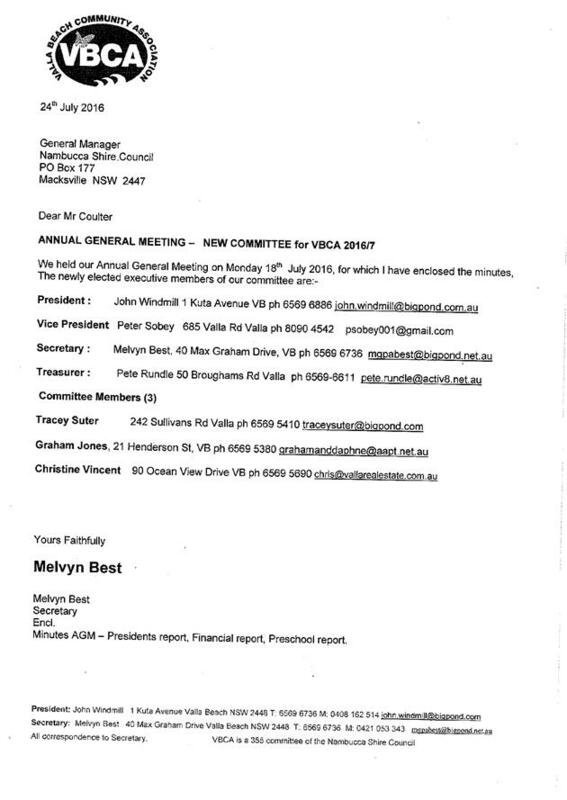 7 That Council note the advice of the Assistant General Manager Engineering Services that the actual construction of the Adin Street detention basin has been placed on hold pending the receipt of the architects plan. The landscaping will be implemented in accordance with said plan. 8 That the Assistant General Manager Engineering Services be asked to pass on Council’s compliments to the staff in regard to the innovative proposal for the replacement of Coleman’s Bridge. That Council receive and note the information provided in the Waste Management Quarterly Report for the period 1 April – 30 June 2016. That Council note the recommendations in Item 11.1 in Open Meeting. There being no further business the Mayor then closed the meeting the time being 7.52 pm. Confirmed and signed by the Mayor on 11 August 2016. Mr Barry Wilkes has made a request on behalf of the Macksville/Bowraville Uniting Church for a donation of tipping fees for twelve tonne of waste. The Macksville/Bowraville Uniting Church operate an Op-Shop in Bowraville and are struggling to cover the cost of tipping fees for the material that cannot be recycled. They were not aware that they could apply for a donation of tipping fees when Council advertised its Donations program. Update provided by Coordinator Strategic Planning and Natural Resources that the draft will be circulated to Councillors in the week commencing 8 August 2016. Staff to investigate opportunities to develop projects using solar panels and report back with ideas including opportunities to reduce energy costs at the Bowra Dam such as floating solar panels. Report to look at funding opportunities. b. two vouchers, of which one can be used for collection and the other used for delivery. * Refer below to the clarification of the term, “vulnerable customer”. * Refer below to definition of terms. Whilst best-practice water supply pricing will allow many customers to reduce their water supply bills, a small number of vulnerable customers may face financial hardship due to increased water bills. Such customers are large families on low incomes, who have a high level of non-discretionary water use and home dialysis patients. It is recommended that LWUs (Local Water Utilities) define vulnerable customers as families holding a Health Care Card and who have three or more children and households with a patient on home dialysis. · Cash rebates for part or all of the access charge component of the water bill. Prior to the adoption of such programs, it is recommended the LWU undertake an incidence analysis to identify the likely number of vulnerable customers adversely affected and the likely impacts of each option on the customers and the LWU’s revenue. property developer means a person engaged in a business that regularly involves the making of relevant planning applications by or on behalf of the person in connection with the residential or commercial development of land, with the ultimate purpose of the sale or lease of the land for profit. (d) if the corporation or a related body corporate of the corporation is a stapled entity in relation to a stapled security—a person who holds more than 20% of the units in the trust that is the other stapled entity. The minutes of the Nambucca Shire Council Access Committee meeting held Tuesday 26 July 2016 are attached for Council’s endorsement. There are 5 recommendations for Council’s attention. 1. The Council note that a submission (to the Legislative Assembly Committee on Community Services inquiry into the access to transport for seniors and disadvantaged people in rural and regional NSW) was made by Cr Smyth along the lines of discussion at the Committee’s previous meeting; and further note that the document cannot be made public until after publishing by the Legislative Assembly sometime in August. 2. That the cycleway project connecting Upper Warrell Creek Road with the footpath network at the corner of Boundary Street and Pacific Highway (soon Giinagay Way) Macksville be listed as priority in Council’s Cycleway Plan, and be considered in any reviews for Section 94 Plans and the Community Strategic Plan or in future asset planning. 3. That the Access Committee provides a letter of support for applications for funding the cycleway projects. 4. 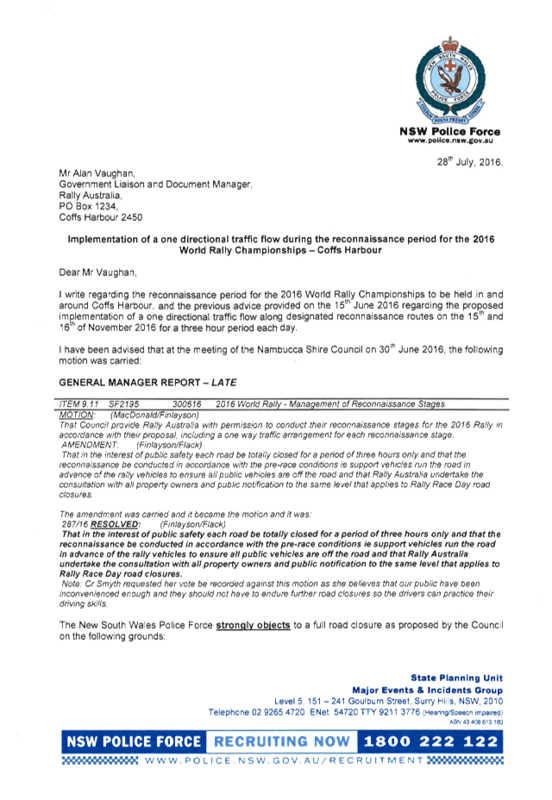 That a letter be sent to the Manager Caltex Service Station Macksville enquiring as to future plans for the site (post by-pass) and whether consideration has been given to providing overnight parking for Recreational Vehicles given the site’s central location and excellent wheelchair access. 5. That the information regarding the Recharge Scheme be sent to Nambucca Plaza, Macksville Ex-Services Club and the Chambers of Commerce. 6. That Council endorse the remaining minutes of the Nambucca Shire Council Access Committee meeting held 26 July 2016. · Transport to doctors and specialists. · encouraging walking and cycling as the best choice for short local trips. Note: Footpaths are not eligible. Council staff have assessed these options and have identified the Priority Cycleways Program as most appropriate. This program is to improve cycling access on major routes within five kilometres of major centres. Up to 100% funding is available to bicycle infrastructure proposals identified in a NSW Government plan as a Priority Cycleway or on a NSW Government owned asset such as the Pacific Highway. Applications for Cycleways North and South of Macksville along the Pacific Highway are being prepared for submission under this Program. Note: Council’s recent Customer Satisfaction Survey showed footpaths and cycle ways as “Higher Importance, Lower Satisfaction”. The cycleway south would connect south Macksville with the town centre by a continuous path of travel and in-fills a gap in the cycleway network. It will provide an important connection to the Nambucca Valley Care aged care facility (under construction), the Hospital, Macksville High School, sporting facilities including the Macksville Memorial Aquatic Centre, as well as connections further afield to St Patricks Primary School and Macksville Industrial Estate. It also provides the most direct route (as opposed to travelling via Wallace Street) and is just under 2 kilometres. All these factors indicate that this project would rank fairly high. The project is listed as a future option in Nambucca Shire Council Cycleway Plan 2016 however it is fast becoming a high priority with development in south Macksville – the new Primary School, growth in the Industrial Estate and a major subdivision on Upper Warrell Creek Road (eventually around 400 lots). Also, the forthcoming changes to the Pacific Highway give the project even more importance as cycling from Bald Hill and Donnellyville become a viable option. This project would involve construction of a cycleway between Kingsworth Estate and Nursery Road North Macksville near Mid Coast Trucks. Whilst this project doesn’t involve the range of destinations that the south project does, and therefore not rate as highly under the Program’s criteria, it does greatly improve access between the two towns. The current Pacific Highway has narrow shoulders and offers a real challenge for cyclists. A cycle way improves the prospect of commuting between the towns for work, school, and leisure. For some years the Access Committee has been interested in tourism for seniors and people with disabilities to promote access and inclusion and further, they are a growing market. The Committee has produced Mobility Maps, the Brochure – “Access and Disability Information for Visitors”, and the Missed Business booklet; and is now working towards a project to support the vitality of towns post by-pass by exploring how the community can better respond to the travel needs of so-called “Grey Nomads” and people with disabilities. Members of the Committee are keen to support initiatives by Council, Chambers of Commerce or others. A national program that supports elder residents in electric wheelchairs is calling on local government and community to get involved. The Scheme promotes initiatives such as introducing designated power point for people to recharge their scooter or wheelchair battery. Assistance includes a start-up kit, access to a national web platform, promotional material, risk management protocols and insurance. The Access Committee has not identified any Council owned property as this stage, however there may be local businesses which might wish to provide a facility from a business promotion angle. Cr Smyth declared a Non-Pecuniary – Less Significant Conflict of Interest regarding Item 3.4 (2) “Seniors and People with Disabilities – Tourism” as she is a member of CMCA which promotes RV-Friendly Towns. That the Committee confirm the minutes of the meeting held 28 June 2016. The Committee noted that a submission (to the Legislative Assembly Committee on Community Services inquiry into the access to transport for seniors and disadvantaged people in rural and regional NSW) was made by Cr Smyth along the lines of discussion at the Committee’s previous meeting; and further noted that the document cannot be made public until after publishing by the Legislative Assembly sometime in August. 1 That the cycleway project connecting Upper Warrell Creek Road with the footpath network at the corner of Boundary Street and Pacific Highway (soon Giinagay Way) Macksville be listed as priority in Council’s Cycleway Plan, and be considered in any reviews for Section 94 Plans and the Community Strategic Plan or in future asset planning. 2 That the Committee provides a letter of support for applications for funding the cycleway projects. 3 That a letter be sent to the Manager Caltex Service Station Macksville enquiring as to future plans for the site (post by-pass) and whether consideration has been given to providing overnight parking for Recreational Vehicles given the site’s central location and excellent wheelchair access. 4 That the information regarding the Recharge Scheme be sent to Nambucca Plaza, Macksville Ex-Services Club and the Chambers of Commerce. 1 Fiona Henwood and Tamson Mayo left the meeting following the motions relating to Item 3.4 with the time being 2.50 pm. 2 The item on Macksville Memorial Aquatic Centre was deferred. 3 Interested Committee members were invited to attend the Seniors Living Expo and to provide a report to the next meeting. The next meeting will be held on Tuesday 23 August 2016 commencing at 2.00 pm. There being no further business the Chairperson then closed the meeting the time being 3.30 pm. The following is the Council’s Ranger’s report regarding Council’s Companion Animal Activities and listing of penalty notices issued by Council’s Ranger for June 2016. Council resolved on 26 May 2016 that staff investigate opportunities to develop projects using solar panels and investigate what other authorities across the world are doing and to report this back to Council with ideas including opportunities to reduce energy costs at the Bowra Dam site such as floating solar panels on the Dam surface; further that this report includes funding opportunities. This report provides information about projects using solar panels at Bellingen Shire Council, Lismore City Council and Willoughby City Council, as well as overseas projects in Japan and England. Investigations have revealed a useful and cost-effective initiative – Sustainability Advantage – which is promoted and heavily subsidised by the Office of Environment & Heritage. It is believed that investing in this program will provide the best way, all things considered, to investigate which Council facilities would be best suited to the installation of solar panels, as well as enabling a much fuller audit of all of Council’s operations, with likely increased funding opportunities from OEH if Council participates in the program. 1 Council may choose to engage a consultant to examine the feasibility of solar panel installation on Council facilities. 2 Council may choose not to further investigate installing solar panels on Council facilities. 3 Council may choose to investigate establishing a Revolving Energy Fund (REF), similar to that operated by Bellingen Shire Council. Other authorities in NSW and around the world are using solar panels (and solar hot water heating, where needed) on public buildings, sewage treatment plants, car parks and dams. 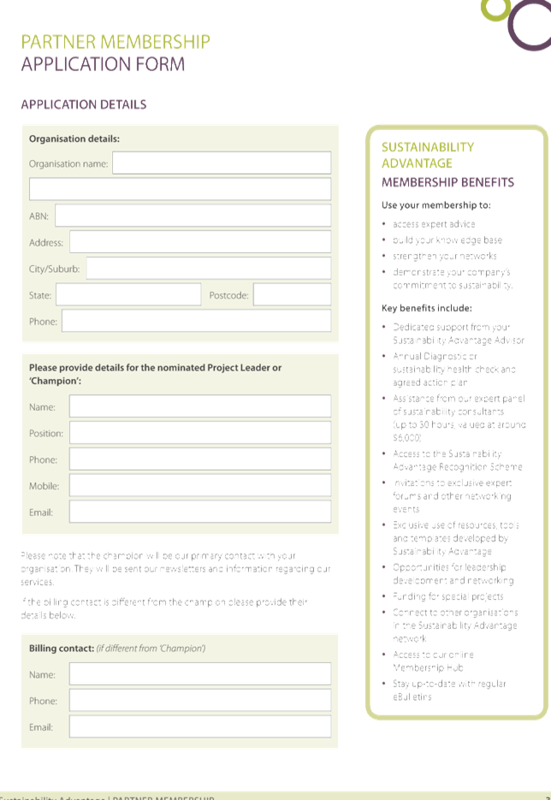 Five projects are discussed in detail below, together with information on how they were funded, where that information has been made available. At Bellingen Shire Council’s (BSC) meeting on 25 May 2016, a report was presented to Council about the above issue. The installation of solar panels on Council sites forms part of the Bellingen Emissions Reduction Program (BERP) – information about BERP can be obtained from the BSC website. A BSC Resolution was made on 22 April 2015 to investigate the feasibility of the installation of renewable energy supply and efficiency measures at Council’s largest energy consuming sites. As such Council engaged Bellingen Solar Depot to complete this work. Whilst the exact cost to BSC is confidential, it is believed to be in excess of $4,000. It is anticipated that the above installations will save approximately 357 tonnes of carbon dioxide equivalent emissions per year. BSC resolved on 4 December 2007 to set up a Revolving Energy Fund (REF). The REF is maintained through the transfer of savings from energy efficiency measures and the installation of renewable energy supply into an account of funds to be made available to implement further efficiency and cost savings. Savings of $60,470 achieved during 2014/15 have been deposited into the existing amount in the fund, making the total amount now available for expenditure $118,335. BSC has resolved that the Revolving Energy Fund (REF) be used to fund the installations on the main administration building, Raleigh depot and Dorrigo depot. Financial savings resulting from these installations are to be deposited back into the REF for expenditure on future installations. The above allocation of funding out of the REF would allow sufficient remaining funds in the REF to be allocated as matching funds in grant applications to complete the solar installations at the Bellingen Pool, Dorrigo Library and Urunga Library. It is expected that these facilities are more likely to attract grants under community wellbeing funding programs. It is proposed that the funding required to complete installations on the water facilities is sourced from the capital works budget reserves, with the resulting financial savings reducing expenditure from this budget over the life time of the operation of the installations on these facilities. The feasibility assessment of each site identified a maximum payback period for installations on water facilities as 3.60 years, meaning that costs will be recovered by the end of that period. It is also proposed to allocate money from the capital works budget to the installations at the Raleigh Waste Facility and at the Bellingen Waste Transfer Station. Completing all assessed installations would result in a total net cash benefit during the minimum 25 year effective operating period of $2,568,190. It is expected that installations will perform well beyond this period, resulting in ongoing financial savings. The average annual net financial benefit of the installations over this lifetime is expected to be $102,640. In December 2014 LCC adopted a Renewable Energy Master Plan with a goal to self-generate all their electricity from renewable source by 2023. The process started in 2013 when Council undertook the largest community consultation in its 134-year history. During the 18-month Imagine Lismore consultation, thousands of residents were asked to identify their priorities and the environment topped the list of things people cared about. The community expressed a wish for Lismore to become a model of sustainability. From this consultation, LCC developed a Renewable Energy Master Plan. It follows on from a decade of work in which Council tried to reduce greenhouse gas emissions after recognising climate change was a reality. LCC and Farming the Sun launched the Lismore Community Solar initiative in May 2013. The goal is to establish a council/community solar farm in Lismore – potentially the first of its kind in Australia. Since then in-depth investigation has gone into suitable sites and suitable financial models to get the solar farm up and running. The initial concept was to have a 250kW solar system owned by the community, with Council agreeing to buy back the power over a decade or more. However, obstacles such as difficulties with sharing power across Council sites and the uncertainty of federal renewable energy policy has led to a change in thinking. It has become clear that two smaller-scale projects will be more viable and the financial model would be in the form of a community loan rather than a power purchase agreement. The Lismore Community Solar investment structure is now based on two community companies, each with 20 shareholders, lending funds to Lismore City Council. The loans will be used to construct and operate two 100kW solar farms at the Goonellabah Sports and Aquatic Centre and the East Lismore Sewage Treatment Plant. Investors would be asked to purchase shares between $8000 and $9000 with a four per cent per annum return and a pay-back period including up-front capital of seven years. Farming the Sun has launched an investor pledge campaign to attract 40 investors to buy shares in Lismore Community Solar. The event was well attended and there are already more than 101 pledges. Council adopted the financial business model at its meeting of 13 October 2015. A prospectus is now being prepared by Farming the Sun for share offers. 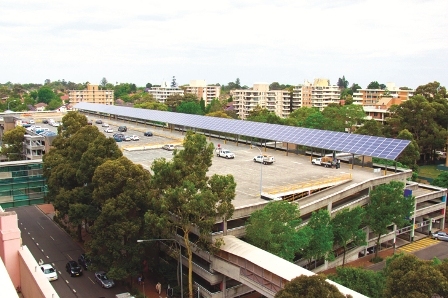 In October 2011 the first stage of the Albert Avenue Car Park Solar Farm Project located adjacent to Westfield Shopping Centre, Chatswood was completed on behalf of WCC. The peak capacity of the Car Park Solar Installation is 34kW. One of WCC’s key requirements for the Stage 2 Solar Farm was to feed renewable electricity from the Solar Array into a neighbouring community building called the Dougherty Centre. The green energy produced from the Albert Avenue Solar Farm contributes to the common area electrical load for the centre. The system continues to promote WCC as a community champion in environmental initiatives. It visibly demonstrates Council’s commitment to taking action on climate change and simultaneously provides it with financial and environmental rewards. The Japanese electronics multinational Kyocera has recently begun work on what it claims will be the world’s biggest floating solar farm. Several floating solar farms have already been built in Japan as part of the country’s drive to exploit more renewable energy in the wake of the 2011 Fukushima disaster. The shutdown of nuclear plants has seen Japan increasingly reliant on fossil fuel imports that have hit its emissions-cutting ambitions. The Yamakura dam power plant will see more than 50,000 solar photovoltaic panels cover 180,000 m sq area, but compared to other land-based plants it is relatively small. At 13.7MW when finished, it would not make the top 100 of the world’s largest solar photovoltaic farms. Finding land for utility-scale solar power plants has become a challenge in Japan due to limited availability of land space and rapid implementation of solar power. The construction of solar power projects on lakes is considered to be a practical solution, as it allows the available land to be used for agriculture, conservation and other developments. Moreover, Japan has a number of inland waterways and reservoirs built for agricultural and flood-control purposes that can be used for the development of solar power plants. With an objective to reduce its burden on the environment, the Public Enterprises Agency of Chiba Prefecture began encouraging companies to build and operate a floating solar power plant at the Yamakura Dam. Kyocera TCL Solar was selected to undertake the solar power project. On the outskirts of London, work is nearing completion on what will soon be Europe’s largest floating solar power farm. The £6m QEII project will generate enough electricity to power the utility’s local water treatment plants for decades. The energy will help provide clean drinking water to a populace of close to 10 million people in greater London and the south-east of England, a huge and often unrecognised drain on electricity, rather than nearby homes. Thames Water has decided to install solar panels on water because the water is there, and might as well be used for this purpose. Floating panels, covering only about 6% of the reservoir, will have no impact on the ecosystem of the reservoir. Though waterbirds, including moorhens and gulls, live on the margins, and a thin scum of litter is visible at the shore, the reservoir is not intended as a home to wildlife, and any fish living here are accidental visitors. Eighteen metres deep, it provides water for Londoners in a constantly churning stream. Although most of the population growth in London tends to be towards the east, most of the water still comes from reservoirs to the west of the city. But future projects to make use of water companies’ reservoirs in order to provide solar power might be in doubt, as the government has reduced subsidies for solar and wind power. This would not affect the QEII project, but might have an effect on whether follow-up projects could go ahead. It is possible that there may be savings to be found for Council by installing solar panels on Council’s facilities, including the Bowra Dam. The issue to be resolved is determining which, if any, facilities will benefit from the installation of solar panels. Due to the relatively low levels of feed in tariffs paid in NSW, Council is unlikely to see any financial benefit unless it is able to directly use, or to store and then use, any power it generates. Council’s staff, particularly Council’s Manager Water & Sewerage, have undertaken some investigations into this issue. He notes that Council’s water supply and sewerage systems are large energy users so there may be some opportunity for offsetting costs with solar power. However, it is very complicated with the different tariffs and peak demand charges that are imposed by the energy suppliers as well as the intermittent demands of the treatment plants and pump stations themselves, to determine what savings can be made. The sewerage treatment works at Nambucca Heads and Macksville are high energy users consuming around 20, 000 kWh of energy per month at a cost of around $5,000 per month. This is around 600 – 700 kWh per day. The predominant use of energy is for the aeration blowers that operate for around an hour at a time with 8 cycles during a 24 hour period. If the power requirement for the blowers could be provided during the daylight hours the cost of this might halve during this time and could save in the order of $1,000 /month or $12,000 per year. If the system cost $200,000, which is the assumed cost of the Lismore City Council system, it would take around 17 years to recoup the cost of this system. The water supply headworks including bores and transfer pumps use approximately 100 kWh per month. Peak demands average around 150 KVA and can go over 300 KVA. The current cost is around $20,000 per month when filling the dam, down to $12,000 when the dam is full. This allows for no pumping during peak tariff times. Given the large power demand of the pumps and our current management of pump run times Council’s Manager Water & Sewer doesn’t see solar as being cost effective in the short term. As water demand increases with population growth and more daytime pumping is required the use of solar power may become more viable particularly as its cost decreases. However having the space to accommodate panels close to the headworks infrastructure will remain a big problem. Power usage at the dam itself is only around $400 - $500 per month so it is not believed that there is any great benefit to be obtained from installing solar power. Significant expenditure would be required on infrastructure to transfer the electricity generated to the water headworks site where it is used. So that accurate information about costs and savings can be evaluated, he believes it would be better to engage a consultant to thoroughly investigate energy usage patterns at our largest power consuming installations and determine whether the energy likely to be produced by solar in this area is a match to provide cost savings. Contact was made with the Office of Environment & Heritage (OEH) to seek their input on these matters. Information was provided about the Sustainability Advantage program (SA), which is a program through which OEH assists organisations who are committed to improving sustainability in their business operations. 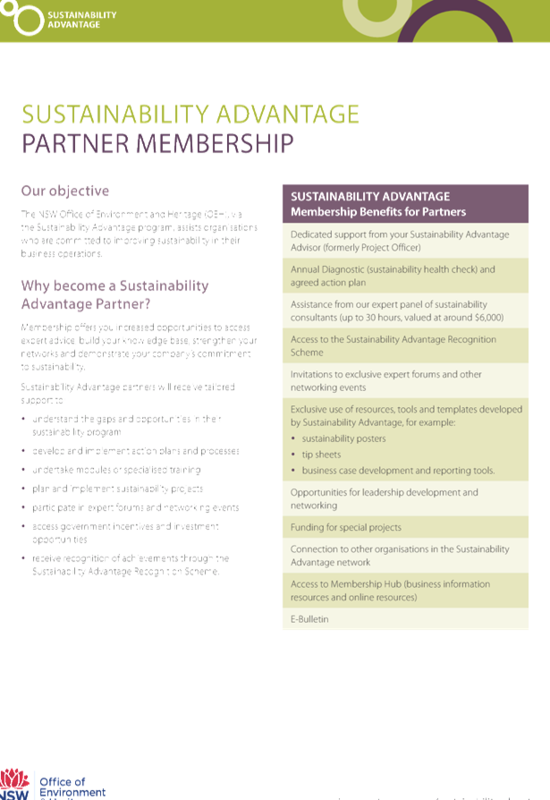 Sustainability Advantage is open to organisations from the not-for-profit, government and medium-to-large business sectors, and attracts participants from many industries, including manufacturing, commercial property, registered clubs, health, aged care, transport and education. It would be possible for Council to use the 30 hours of expert assistance to have a report provided about installing solar panels on Council’s facilities and assets. Additionally, it is likely that other ways of becoming more sustainable and saving funds would be identified on top of this. 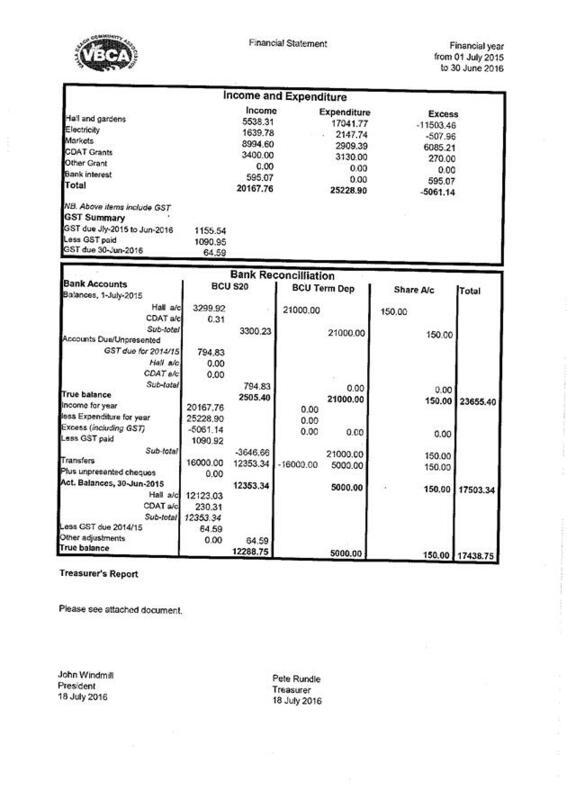 Together with the opportunities for additional funding from OEH, the $4,000 cost involved to become a partner seems much better value than spending more than this to obtain a report about solar panel installations. SA is forming clusters of similar businesses/sectors to provide greater opportunities to share information and conduct research into common areas of sustainability which that sector shares. Council would become part of the Local Government Cluster, which is aiming to implement 2 to 3 projects that address priority issues. The projects could be waste, energy, procurement & supply chain or policy or anything else identified by the cluster. There is no additional charge for this aspect of the program. Currently, approximately ten Councils are Partner Councils and OEH and SA are working to have more Councils join. Wollondilly Shire Council joined SA last year with a focus on improving sustainability in waste services through a Resource Recovery hub. Their Waste Officer believes it has been highly beneficial to be involved in the program. They have had sustainability training for staff, provided at no charge by OEH, additional funding from OEH, the opportunity to work collaboratively with other Councils and excellent provision of information. He highly recommended the program and said the benefits generated from the $4,000 program cost were highly worthwhile. Discussions have also been held with Bellingen Shire Council staff who would be very interested to hear of Council’s experience and, if positive, would definitely consider investing in SA as well. There is further information at http://www.environment.nsw.gov.au/sustainabilityadvantage/index.htm - including case studies and learning modules that Council can complete. 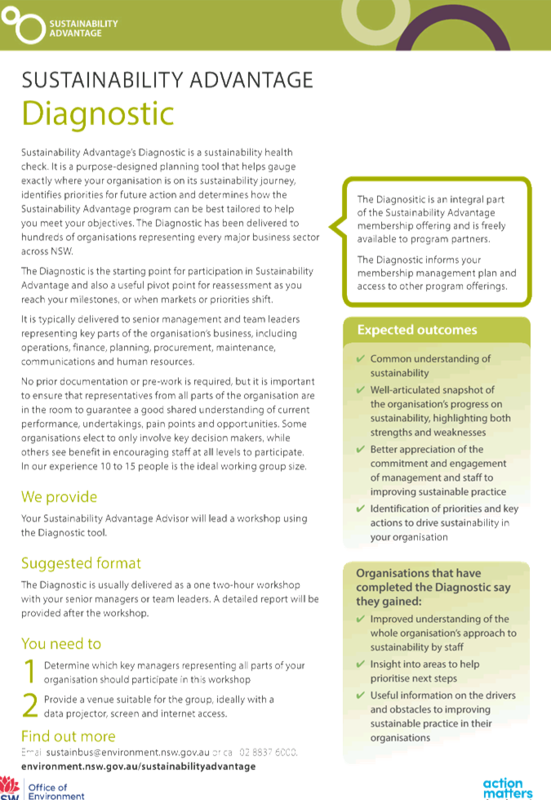 Two documents with additional information are attached - an introductory information brochure and a form about the Diagnostic that is carried out. The cost to Council is $,4000 and membership lasts for one year. It can be renewed annually for a long or short as Council wishes for whatever the annual fee is at the time. A core group of Council staff - six to eight - will need to commit time to this project. It is anticipated that the majority of them will need to spend 3 to 4 hours a month on the project, with half a day needed for the diagnostic and other commitments to be determined once priorities are set. The Environmental Levy Budget – Climate Change Adaptation Fund could be a funding source for smaller projects. This fund has $20,200 this year – if $4,000 was invested in the SA program, $16,000 remains. Grant funding could be sourced from OEH – it appears that participation in the program will lead to additional funding opportunities – some of which may be fully funded. If larger projects are considered, Council may wish to allocate funds in the 2017-2018 Environmental Levy or seek a loan from the Clean Energy Finance Corporation. This entity has a Local Government Finance Program and is offering Australian councils access to tailored finance to help them invest in a range of clean energy technologies which will reduce energy costs while lowering emissions. The program is targeting major investment projects with the potential to make a significant difference to a council’s energy consumption. If Council chooses to fund projects which save money as well as improving environmental sustainability, consideration should be given to creating a fund similar to Bellingen Shire Council’s Revolving Energy Fund. Council could choose to have a policy of investing a certain percentage of monies saved into such a fund to provide funding for future sustainability projects. The aim of the program is to identify ways in which Council’s processes can become more environmentally sustainable. It is expected that participation as a partner will have a beneficial environmental impact, not only initially, but on an ongoing basis. Whilst the main benefits to the Shire will be environmental and financial, it is considered that most of the community will endorse Council’s participation in such a project. Further, membership of the program is open to businesses, not-for-profit organisations and other government bodies – Council’s participation could lead to other organisations in the Shire also becoming involved, raising community interest in environmental issues. It is expected that participation in the program will help identify savings to Council’s expenditure on such items as power, etc and increase levels of grant funding from OEH. The experience of other Councils, not-for-profits, government organisations and businesses is that savings discovered through the program have vastly offset the initial costs involved of implementing sustainability measures and staff time incurred. There is no risk involved in participating in the program. There is a one-off fee of $4,000 to become a Sustainability Advantage partner for one year. Council may then choose to pay the same fee each year to renew its partnership. Partnership can cease whenever Council chooses. If Council wishes to go ahead with the program, it is suggested that the $4,000 fee come from the Environmental Levy Fund – Climate Change Adaptation Fund. A small group of Council staff - probably six to eight - will need to meet from time to time as part of the partnership. For most participants, this commitment will be approximately 2-3 hours per month. Given the potential budgetary savings and environmental improvements, it is considered that this commitment is reasonable. · Would like a hedge built along entire boundary to reduce the effects of spraying. Below is a list of Development Applications and Complying Development Applications received in July 2016 as at 4 August 2016. The attached report, produced from Council’s computer system, Authority, is for the information of Councillors with regard to approved Construction and Complying Development Certificates for the month of July 2016 as at 4 August 2016. A report on the progress on implementation of the Community Strategic Plan must be presented at the final meeting of an outgoing Council; a draft of this report has been circulated for Council’s consideration. This report also informs Council about the review of the Community Strategic Plan by the incoming Council which will be elected in September 2016. The IPR Guidelines require a report on the progress on implementation of the Community Strategic Plan be presented to the final meeting of an outgoing Council. This report is then presented to the newly elected Council as part of the review of the Community Strategic Plan. A draft report has been circulated for Councillor’s consideration. 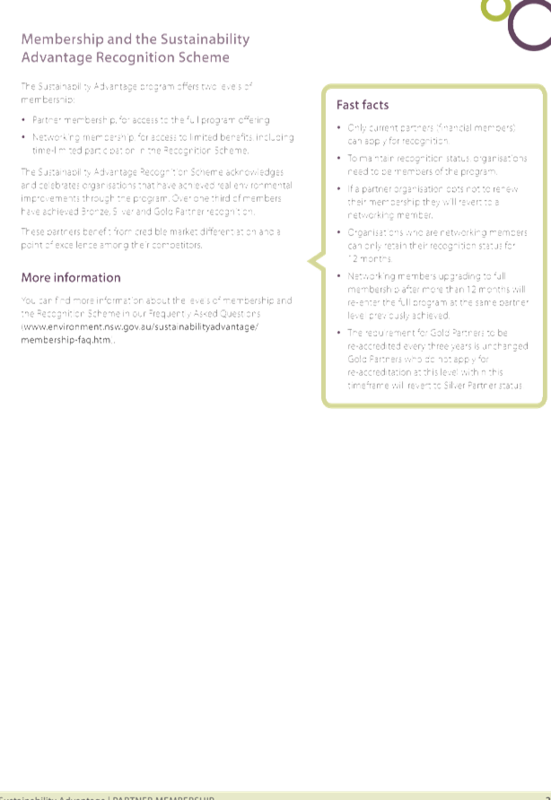 The new Council will be elected in September 2016 and the Community Strategic Plan will need to be reviewed prior to 30 June 2017. Any changes will flow through the entire IPR suite of documents and necessitate community consultation on the reviewed documents. 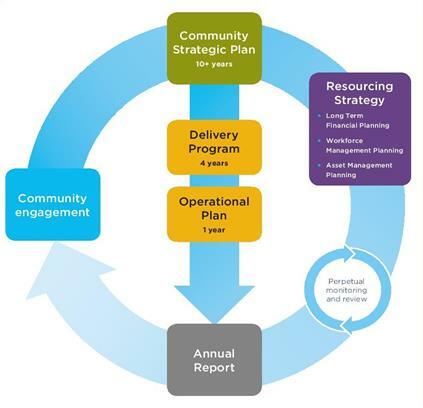 Changes in the Community Strategic Plan will flow through the Delivery Program and feed into the Operational Plan. This review also presents an opportunity to refine linkages between the documents, corporate performance reporting and financial management structures. 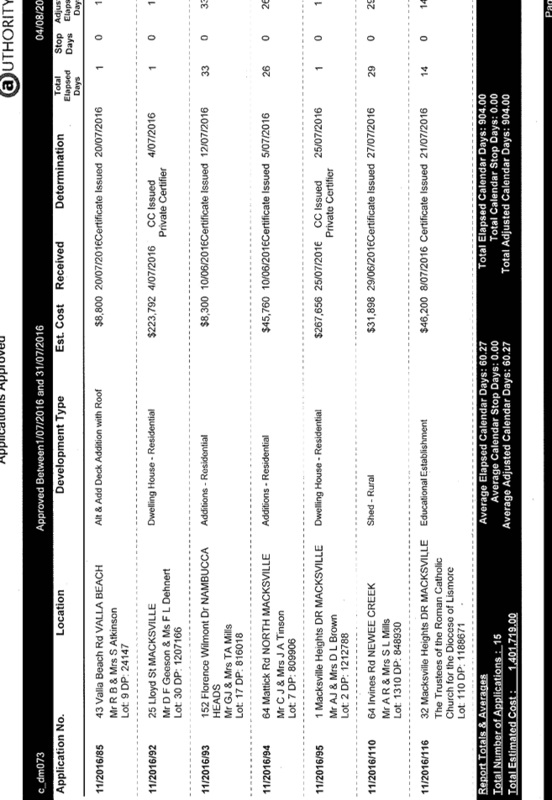 The time table below was developed by Council Management team. It sets targets for actions needed to produce IPR documents commencing July 2017 based on a reviewed Community Strategic Plan. Report to Council and Draft End of Term Report circulated for comment. Report presented to MANEX A on progress including a community engagement strategy. Delivery Program and Operational Plan adopted. The plan is to review the documents in preparation for Council’s consideration and prepare a report with suggested changes. This process will be mindful of the objectives to produce concise meaningful direction from which to develop Council’s Delivery Program and make funding decisions in the operational plan. 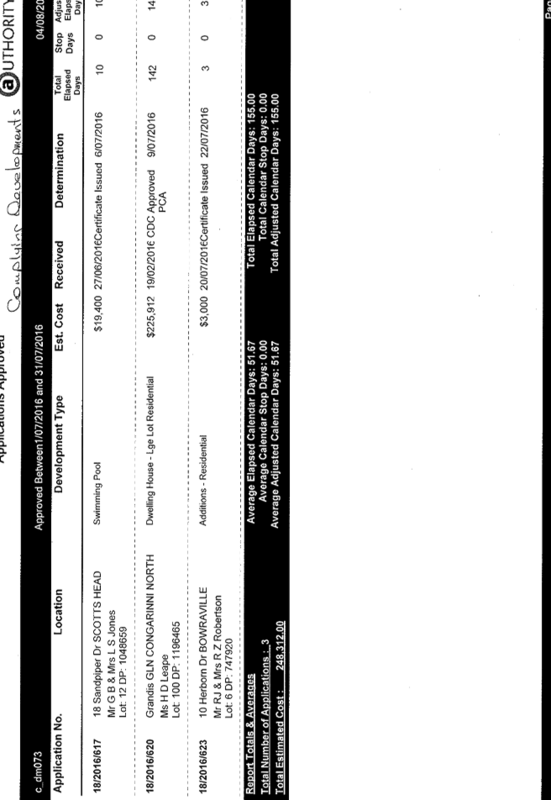 There should be a “clean line of sight” where an objective is described in the Strategic Community Plan is linked to the strategies to achieve that objective in the delivery program; which are in turn linked to funded programs in the operational plan which are designed to deliver those strategies. Specialised Corporate Planning and Reporting software packages where recently evaluated to determine if such a system could be justified. A report was considered at Manex A and it was concluded that the review should be conducted using existing tools and special software not be purchased. The principle reasons for this decision were it was not likely Nambucca would realise many advantages given the scale and complexity of Councils operations and the purchase and implemations costs far outwieghed any probable benefits. Council has previously requested the Contracts Register be reported to Council at least once a year. A list of current contracts on the Register is provided for Council’s information. Council has previously requested the contract be reported to them on at an annual basis. It is proposed to present the register shortly after the end of the financial year as this co-insides with collating the information for the Annual Report. 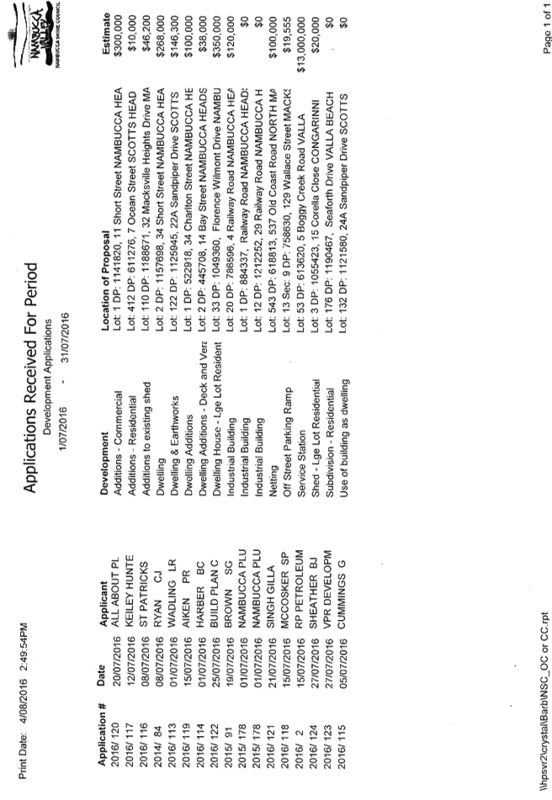 An extract of current contracts from the Register is included below. 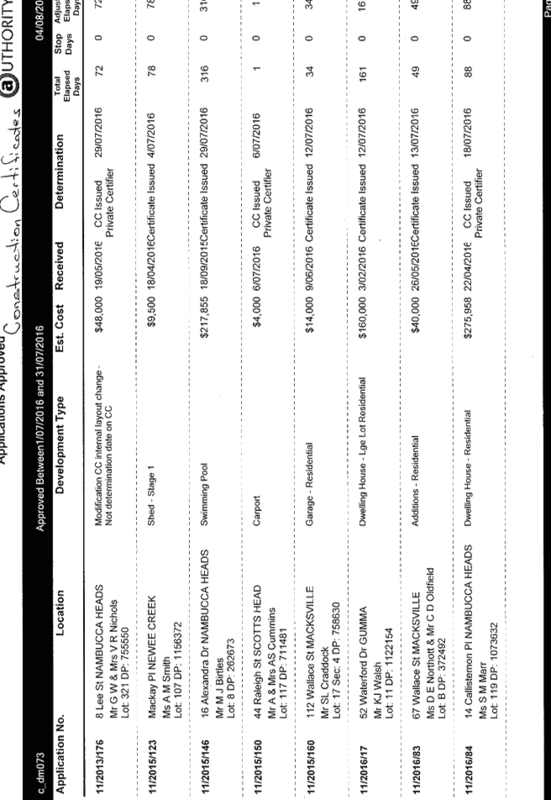 The Register in its current form commenced in 2010. 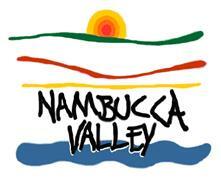 The full Register can be found on the Council Website at http://www.nambucca.nsw.gov.au. For Council’s further information a list of standing offer contracts is included below – these contracts don’t reach the threshold for inclusion in the Contract Register. 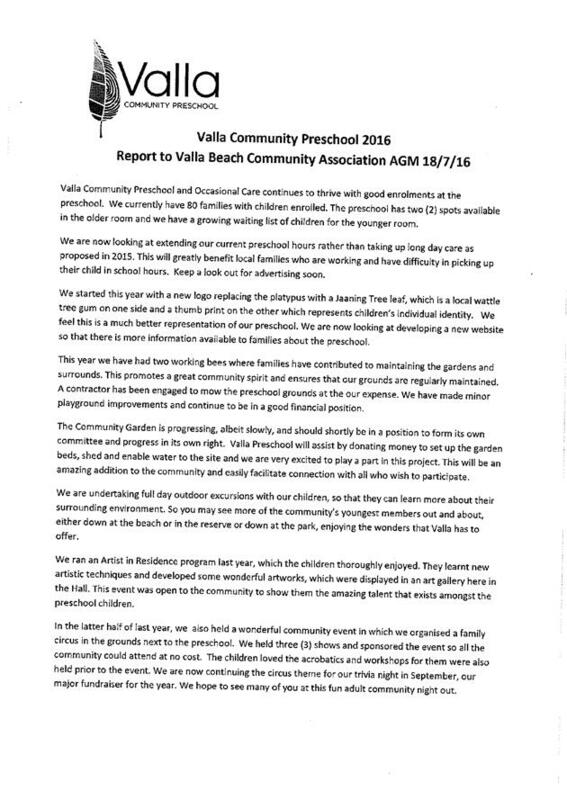 The Annual General Meeting of the Valla Beach Urban and Hall Committee of Management was held on Monday 18 July 2016. The agenda and minutes of the Nambucca Shire Traffic Committee meeting held on 2 August 2016 are attached for Council’s information and adoption. In relation to Item 4.2 - Rally Australia Request For One Way Traffic Reconnaissance – please read the information in the Discussion section below. 1 That Council install No Stopping signs on Centenary Parade, Nambucca Heads at the entry and exit of the bus zone and within 10m of intersecting streets outside Nambucca Heads School. 2 That Council provide Rally Australia with permission to conduct their reconnaissance stages for the 2016 Rally in accordance with their proposal and including one way traffic for each reconnaissance stage. Rally Australia (RA) have requested Council review their decision for a road closure and offer the information supporting their request for approval for One Way flow during the reconnaissance stages for the 2016 World Rally. The Council motion requested a road closure under the same terms as the Rally race day. This requires RA to have an official at various property gates, fire trails, or well used tracks, that lead onto the rally stage. Based on RA set up documentation from past years, 220 is the number of officials RA would be required to use. For the stages in the Taylors Arm area RA need 70 officials on the Friday and then 150 on Saturday for the Nambucca and Valla stages. In the One Way flow, RA would have officials and Traffic Controllers at the start and finish of each stage, with traffic controllers at each intersection within the stage. RA would not need to place a person at each property gate or fire trail, but instead RA will have completed a community / property owner information process and have signs at each property gate indicating the required traffic direction as a reminder. A full road closure would be an inconvenience to residents to be locked in for 3 hours, (each stage) particularly if needing to travel to work or school. RA understands that closing the road on one day for residents is enough of a problem, but needing to do it again places an unfair burden on the residents. Up to 510 properties will have their access closed. Under the One Way plan, the residents will be advised that they can still travel to and from their properties, albeit in a certain direction only. Each property will be given specific travel directional information, not just a general advisement. With a One Way managed traffic scenario RA are able to manage the speed at which Recce is completed, a Closed Road scenario will encourage higher speeds, as there is no traffic expected. A one way scenario will also set a precedent across the entire WRC and FIA worldwide rally events. Rally Australia is developing a signs package to be placed at each intersection showing the traffic directions and one way roads. There will be sufficient signs per intersection to show allowable travel directions from all approaching directions – signs in place 3 weeks prior to event. RA will place advertisements in local newspapers for 3 weeks prior to recce. There will be information placed on NSW Police, TMC and Rally Australia websites. RA will ask Council to include the information on the Council website also. RA will have information regarding this on all their social media platforms – Facebook & Twitter. There will be a full Traffic Management Plan implemented (TMP) and a detailed mail out of information to all residents. NSW Police have been advised of Council’s resolution of 30 June 2016. Chief Inspector Paul Carrett has provided a response, see attached, strongly objecting to the full road closure. He further advised that NSW Police have primacy with respect to public safety. The Nambucca Shire Traffic Committee meets every two months, generally on the first Tuesday of that month. The members of the Committee met on 2 August 2016 and determined a number of matters as per the attached Agenda and Minutes. Members of the Local Traffic Committee offered no objection to the recommendations above, now being the resolution to Council. The Local Traffic Committee meeting was carried out electronically with agendas sent out via email.